A spooky puzzle game to make you scream! Set the stage and roll to the goal! Expansive and festive holiday puzzle action! Dozens of levels of platforming action. Thanks for the feedback! I hope to be adding mouse controls soon. That was a serious oversight on my part. I enjoyed this! It's a really cool riff on Zelda II in a lot of ways. I actually quite like how the island is absent of enemies in this version. I'd love to see a further exploration of the ideas you're playing with in a future game--maybe one that doesn't require such a particular order of item acquisition and rewards more kinds of exploring. Really dig the ideas you're working with and Guan himself is a pretty neat character. itch.io Community » itch.io » Questions, Ideas & Feedback · Created a new topic Make it possible for HTML5 versions to be secondary to downloadable executables? Hi! I'll put the TL;DR up front: I'd love it if there was a way to offer HTML5 versions of games as equal alternatives to downloadable distrubtions on game pages while still displaying the traditional downloadble game-style itch page. 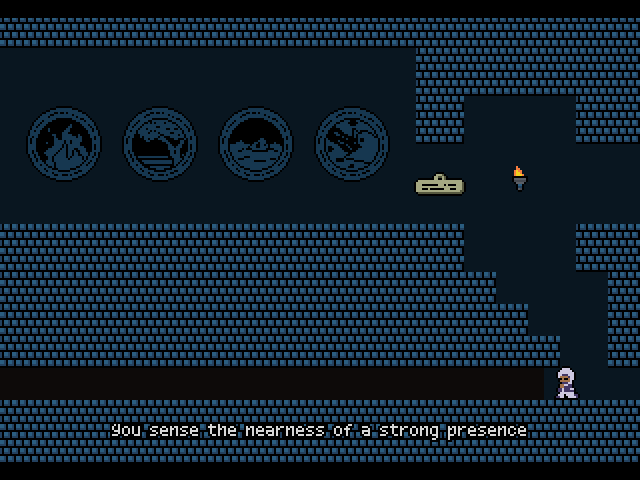 I really like the way that itch displays pages for non-HTML5 games. I like the text right up top and screenshots on the sidebar. That's the presentation I would want for my games whether they're available as downloads or in-browser HTML5 distributions. For example, my game Temple of the Wumpus is available as a download, and I also have an HTML5 version that I've uploaded as well, but itch doesn't seem to offer a convenient way to present the game as available both ways without changing the parts of the presentation I like and making the downloadable package seem secondary to the browser version. If I want the game to be available as an HTML5 game, the presentation changes completely. The screenshots disappear. All the page content is pushed down off the top of the page to underneath the embedded game. I like this presentation a lot less. What I'd love is a way to make it so that when you get to the section of the page where the game is available for download, threre's also a section with a button that allows you to play the game in a browser, on a dedicated page that might look a lot like itch's current pages for HTML5 games. I've come up with a sort of workaround where I link to the HTML5 files through an "/embed-upload/" path on itch's site, but that is not quite my ideal. An alternative, of course, would be to create separate HTML5 and downloadable pages (J. Kyle Pittman did that for You Have to Win the Game), but I'd rather not clutter up both my profile page and itch's search results with duplicate entries for my games. Thanks for reading this! I understand this is asking a lot and would hardly take precedence over some more pressing features I know the itch team is working on. I'm also not sure how widespread support would be for this idea. Itch is a great platform and I love it and I appreciate how much work goes into making it run as wonderfully and cleanly as it does. I love so much about this game, but right now I feel like making special mention of how happy it made me that Kitty is a little tuxedo cat. But truly, this game made a profound impression on me. Thank you for this. It is the year 231 of the Frontier Era. A nine-year space war continues to rage between two mighty powers in the Earth sphere, conducted largely by heavily armed mechanized suits in space battles. Eighteen-year-old Wick Palmer joins the small crew of the spaceship Nauvoo to take control of the Orbital Federated States' most advanced mech. Guarding a remote point in the solar system, the quiet the team has enjoyed cannot hold for long. Guide Wick as he forges relationships with his teammates, fights off enemies, and questions his place in a war that never ends. 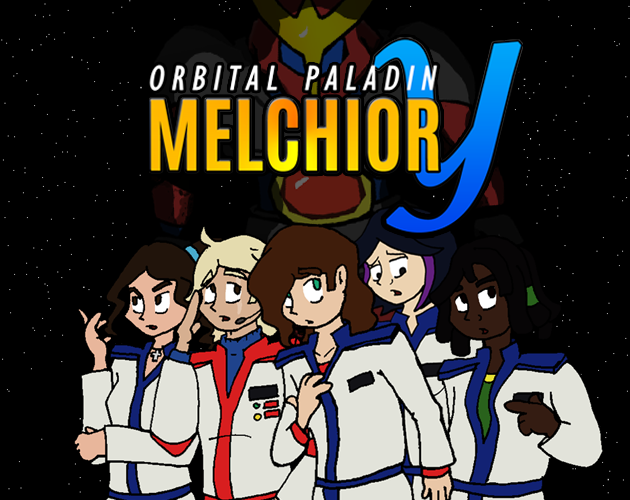 Orbital Paladin Melchior Y is available for download now. Hey! I really dig what you're doing here (I like that part of the game feels like it's a bit of a Zelda II riff, with the downthrusts and upthrusts and some of the gel-like enemies). Yet the speed, structure, and aesthetic give the game feel a really strong and independent identity. I like it, and can't wait to play whatever iterations of this game/concept come after! 1. I think the contrast between the brick background and (especially) the disappearing platforms could stand to be increased, probably by darkening the background. 2. In the stage entitled "As Above, So Below" the jump onto the thin platform in the middle of the room felt unreliable. That is to say, it was hard for me to predict whether I was going to make the jump successfully or not, and it was hard to tell what exactly I was doing that separated a successful jump from an unsuccessful jump (in all cases, it felt to me like I was doing more or less the same thing). 3. The way collision looks, it often seems like my character dies before they come in contact with the harmful object. The hit detection may be a bit too punishing but it also might be smoothed over by the game waiting a part of a second to let me see my failure before restarting the stage. 4. If the projectile-shooters offered even the tiniest bit of animation to signal they were about to fire, I think that'd be neat! I haven't quite finished the game. I may share more thoughts after I do! Good luck with your ongoing development. This is neat! 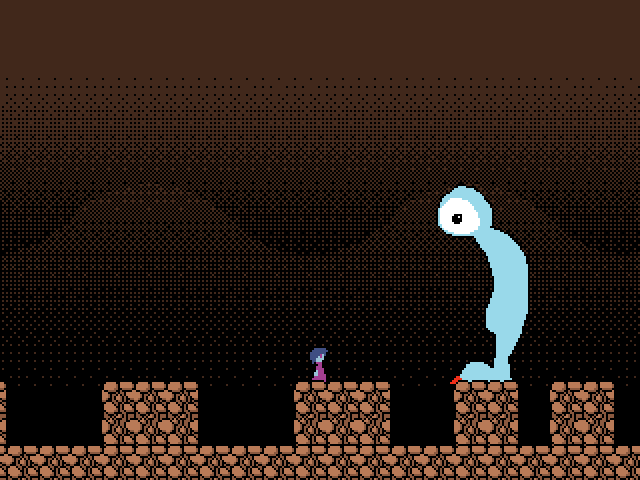 itch.io Community » Game Development » Release Announcements · Created a new topic Monster Hug! A seasonally appropriate game! I've just released MONSTER HUG, a cute, short platformer about going up to monsters and giving them hugs. The game has five unique monsters in different environments. Watch the behavior of each one to know when to approach and hug! This new riff on an arcade classic is a frenzied, asymmetric two-player head-to-head clash: one of you's the Earth and one of you's the Invaders! It also includes a single-player score-attack arcade mode. Does it take a certain amount of time to show up in the "newest games" and the search engine? I seem to remember my previous projects showing up in these immediately, but I published my game Aaargh! Condor about 4 hours ago, and I don't see it when browsing the listing of newest games or when I search for it. EDIT: Update. Now, another hour later, it appears in searches but still doesn't appear in "Recently Added." A remake of a 1983 Commodore 64 classic by Alan G. Osborne, AAARGH! 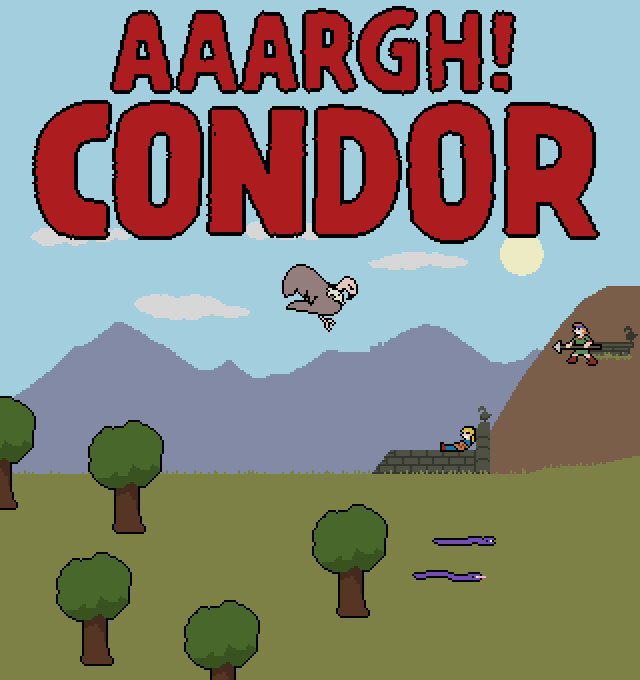 CONDOR gives you three heroes who need to plunge a spear into the heart of a giant condor to save would-be sacrifices. 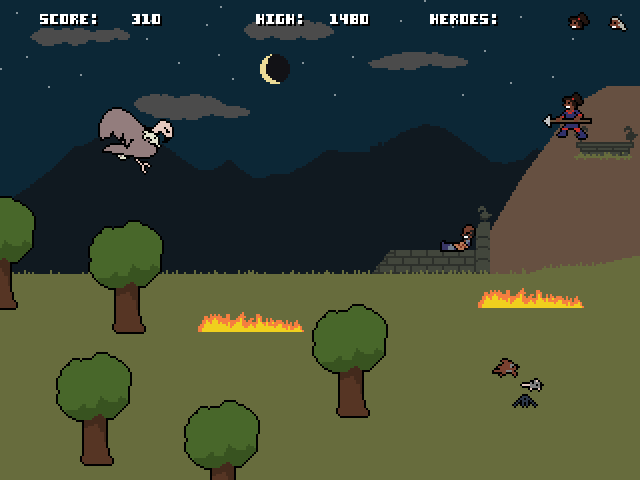 With each new rescuee, the game gets harder with new obstacles and more difficult enemies. Thank you for your kind words! (And the typo alert--fixed!) For whatever it's worth, I was very interested in avoiding straight answers to things in this game, and was very conscious about the fact that I could only expect players to probably read 25-60% of the text in the game. I initially was going to have the sign next to the koi pond say "Don't punch the koi" but found it a bit too tonally jarring, perhaps, for the uninitiated. Maybe I should've gone with my first instinct though. SUPER SPOILER: This game is set in the same world as Koi Puncher MMXVIII, and there are several other textual and visual references to that fact. SPOILERS: Once I'd gotten the ultimate, ultimate ending (at least, I believe it's the ultimate good ending you can get), I wanted to go back and get each ending for each screen to see exactly what you'd written, but it hurt my heart a little to do that to the poor Wumpus each time. I really appreciate the progression of what you know in each screen and how that's reflected in the text you see. Well written and ingeniously structured! Thanks for this game! Wumpus Jam community » Jam Discussion · Created a new topic If you don't finish! If you don't finish your game in time for the end of the jam in a few hours, please let me know! I know some people have bitten off pretty intense projects, and I'd love for them to still be connected to the jam. So if you finish your game too late, please contact me , and I'll try to reopen submissions to accommodate your game. I'd leave submissions open after the submission deadline, but I don't see a way to do that. itch.io Community » Game Development » General Development · Posted in OpenGameArt.org, anyone? As someone who can more or less competently handle programming and design and graphics and can work sound effects generators well enough to get what I want, the one thing that keeps my games from being complete solo projects is music. For a long time, I was just leaving music out of my games. Starting this year, I've released three projects with CC-0 or CC-BY-3.0 licenses for music*. It's elevated the feeling of polish on my projects a lot, I think, and contributes to a more complete experience, allowing me to make games that connect on additional levels. As much as I'd love to work with musicians to compose for my projects, I don't like reaching out to people to ask them to do music for my projects for free since I value the work they do. But since my games are hobbyist passion projects and literally have no budget and are all released as free (and especially since splitting ad revenue or tips can get messy, no matter how meager it can be inevitably is), I really can't afford to pay anyone. I try to feature the names of the artists I use prominently. I get a little nervous that the songs I use will end up being used in a lot of projects and if a player recognizes a track from another game may find that disorienting or tacky, but so many people make so much neat stuff that I find carefully selecting OGA music can really contribute to the identity and mood of my games. I'm really grateful to the artists who make this stuff available to use freely, and I've been thinking that I'd like to develop some graphical asset packs so I can give something back to the community. 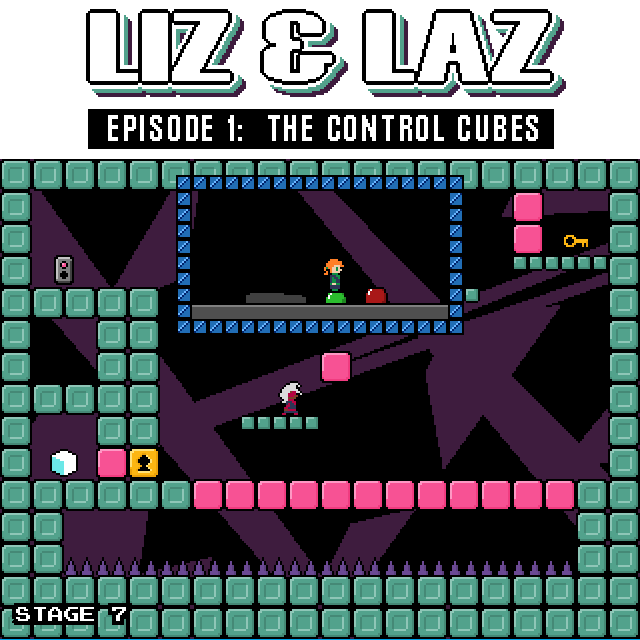 *These games are Temple of the Wumpus, Liz & Laz Episode 1: The Control Cubes, and Koi Puncher MMXVIII. EDIT: Sorry for the old thread bump! Didn't realize how old it was. But it's a topic of perennial interest! Whoa! This feels so cool. I love really studying the behavior of these boxes, really scrutinizing every little move. It's kind of addicting! Ah! Thank you so much for the kind words! I'm glad you had something that sounds like the experience I hoped people would have with it! I love how this looks, feels, and sounds. Genuinely, I found myself just enjoying flying around, soaking in the atmosphere. With the 1-bit dithering effects, it feels somewhere between a grainy old Hollywood movie and a number of Bermuda Triangle entertainment documentaries I watched in the 90s, which is just fabulous. I haven't actually found the Wumpus yet, but I'm gonna search again when I get home tonight! The game is perfectly playable as it is now, but the game will be receiving a small update tonight or tomorrow with a couple of typos/text spacing issues fixed. I may also slip in a small other thing or two. A reinterpretation of the classic BASIC game Hunt the Wumpus by Gregory Yob, this game sends you through over a hundred rooms of an ancient temple. You seek the Wumpus with prayer, scripture study, and special, spiritually infused candles. This is rad! I've never heard of the Channel F. Looking at game screens, I dig the color palette and especially the light-gray background and hot pink sprites/text that you're also using! It's kind of surprising there hasn't been Fairchild Wumpus before, but I'm glad it's being corrected four decades later! If you get the "fairly literal port" done, any chance you might mess around with it a bit from there? Seeing it in action I can't help but think about all the TV documentaries about the Bermuda Triangle I watched when I was a kid! The cryptid thing is a cool idea. Maybe the Wumpus doesn't need to be all that dangerous? I love the look of this! That screenshot puts me in mind of tinted black-and-white film, and the idea of using color to represent the "smell" is relaly cool. Love that the goal is photography too! Thanks! There is so much Wumpus-related knowledge packed into this game. Thousands of words. I'm kind of out of control. I have another screenshot! I'm no all that accustomed to dev blogging, so this is kinda new to me! Please bear with me! The temple is going to have over 100 rooms and hundreds of lines of text. I've got most of the former programmed and laid out and most of the rooms (they're laid out, but some finesse and design flourishes will be necessary/desired if time permits). The next major step will be tweaking my dialog boxes, inputting those scripts into the game, and then locking down the Wumpus movement/seeking mechanics (yes, my Wumpus moves!). 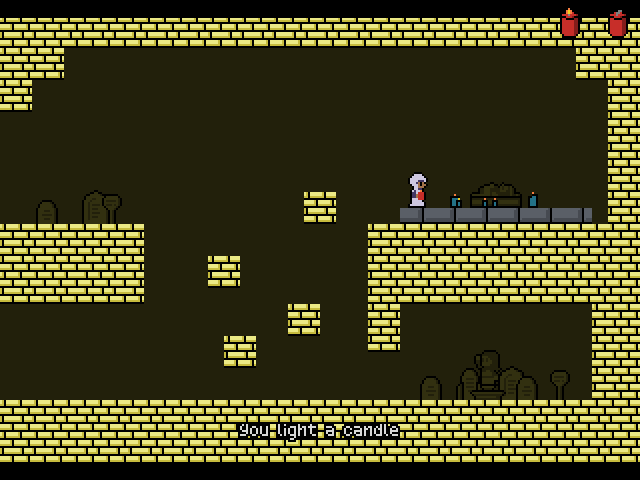 I'm developing this game in both an extremely methodical but also stream-of-consciousness improvised sort of way. I'm excited to finish and share it! 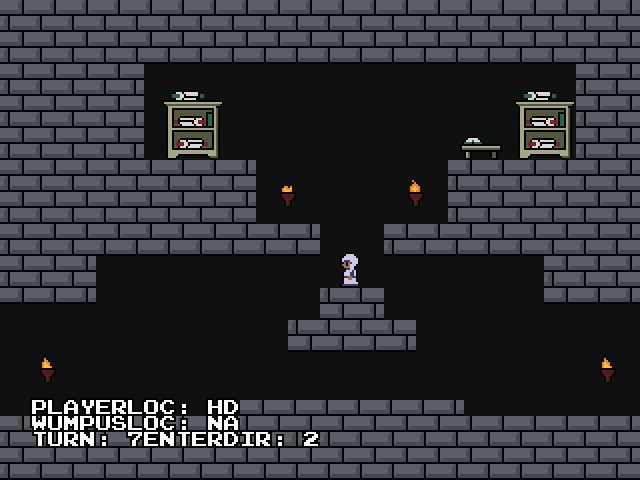 Here's a screenshot (with variables printed on screen)! 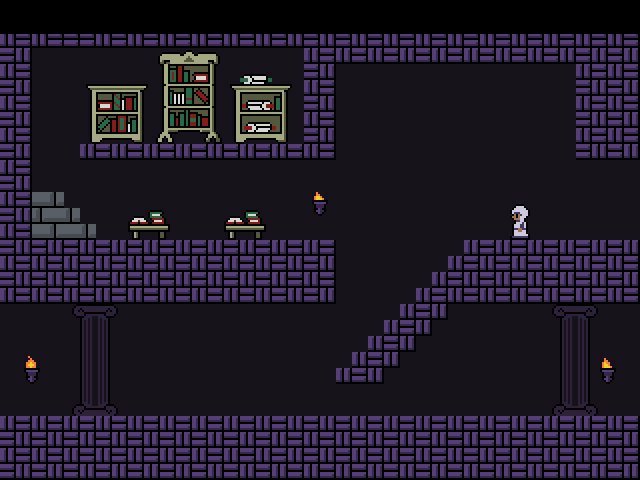 One of over a hundred rooms that will be in the final game. I don't have a screenshot yet, but I do have over 3 pages of notes and dialogue. My initial idea with this was to make a game where you're not hunting a Wumpus, but instead are seeking a divine Wumpus in order to pray in its presence. 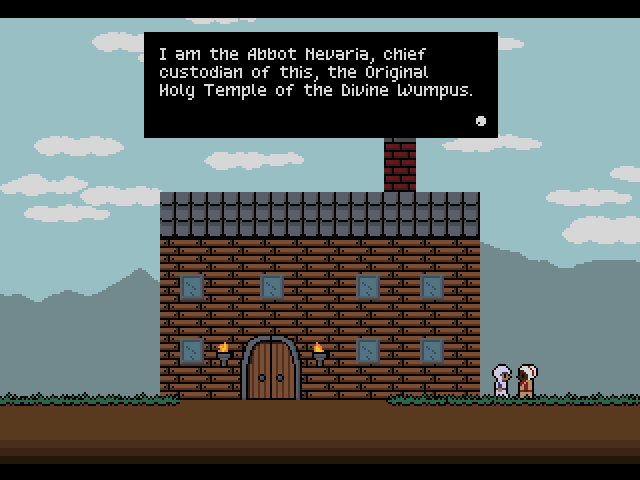 I'm trying to make a spiritual/quasi-religious game, which is a big departure for me! I'm adapting the mechanics of the original game to make this work and with what I want to accomplish it's proven important to sketch out the game design really firmly before I start attempting to program it. With this set up now, though, I think I'm ready to start programming it this week. I had initially not wanted to call the divine Wumpus a Wumpus, but I started using it as a placeholder when I couldn't come up with anything else. It... might stick around. Thanks for your comments and your very valuable feedback! I’m glad you enjoyed the game. I like the idea of a set of buttons on the left side as well as the idea for differentiating the areas of the control pad. These may make it into an update or sequel. Yes, I was hoping to minimize visual distance between the two player characters, but I totally hear what you’re saying. It’s something I’ll be thinking about. To be honest, the switch in stage 11 is kind of a vestigial remnant of when that stage was earlier in the game and still introducing that mechanic. It could very well have been cut, but hopefully doesn’t slow the pace of the game too much. Here's a new, quirky take on the single-screen platformer genre. Rather than controlling your shooting, jumping character directly, you control a separate character who jumps on giant gamepad-like buttons to issue controls to your other character remotely. It gives the game a different rhythm and set of challenges. I hope it's a fresh and interesting twist on the formula! Twelve stages plus a boss stage! Hi Steve! I dig what you're doing with the Indie Corner initiative. Thanks for doing these! Quick Bio of Game: Control cute (and nervous!) little creatures called Explobers as they work together to blast new paths and build their own platforms through dozens of challenging puzzles. A retro-inspired puzzle platformer, Explobers is packed full of varied environmental brain-teasers! How long the Game was in development and if it's still in development, early access, or complete: Complete. In active development for 8 months (released September 2017). Has received three major updates, most recently in May. Why you became a game developer in the first place: I'd been sketching out game designs on paper ever since I started playing games. I'm interested in using games to explore traditional mechanics with new twists and as an outlet for creative expression. "The only real rule is "Don't be hurtful or harmful", breaking this rule will get you banned." That's it. That's the main rule. Other than that, go nuts. Everything else is just more information (and some recommended reading it you want it!). HUNT THE WUMPUS is 45 years old this year! The first known mention of Gregory Yob's classic game was in September 1973's People's Computing Company magazine where you could order a tape of it for $4. Yob made it in reaction to early creature-hunting games like Snark and Mugwump. The game's code was published in Creative Computing two years later. Basically, HUNT THE WUMPUS is a game in which players wander treacherous caves in a dodecahedron layout, searching for signs of the dangerous Wumpus. When they believe they have located the Wumpus, they fire an arrow into an adjacent room. When walking into a room, they might also fall into a hole, be transported by bats, startle a Wumpus and make it relocate, or be eaten by the Wumpus! What can I make for Wumpus Jam? That's open-ended! You might make a digital game, a board game, a comic, a song--whatever!How does the Wumpus theme need to be applied? You're encouraged to take this prompt however the heck you want. Think about the game world's dodecahedron shape. Think about hunting. Think about drafty rooms. Think about why anyone would hunt a wumpus. Think about the two-action (Move/Shoot) mechanics of the original game. Why did Yob make it? Think about the wumpus itself (what does it even look like?). Does I have to put a Wumpus in it? Nope! Since the prompt is very much open to interpretation, games with Wumpuses are great and games that have nothing resembling a Wumpus at all are also great! Do you have some recommended inspirational reading/playing for understanding Wumpus? Read the Wikipedia article about HUNT THE WUMPUS for an overview of the game's design, impact, and legacy. Read this pair of articles from the Digital Antiquarian about Hunt the Wumpus and the milieu it came from. Read this section of 1979's book MORE Basic Computer Games featuring a one-page article by Yob about the game's origins and the game's BASIC source code. This 1975 issue of Creative Computing has the same article text and a sample run of the game. Also check out this video of the wild, awesome-looking graphical TI-99 adaptation (the visual rendering of this wumpus has had a distinct impact on people's understanding of the wumpus), from 1981. Can I win this jam? This is a non-competitive jam! The winners will be those who make something for it and those who get to play neat new games (or whatever else you make!)! Do I have to have a team? Nope! Go it alone if you like, enlist your roommate, partner with your child, or form a great big team! Can I reuse old assets or rework/finish old projects? Where can I share progress and see others' progress? Right here in this community category! Now please, enjoy WUMPUS JAM! After wanting to make one for a while, I finally made my first Bitsy game today. I was enjoying this. Then the pawns got involved and I started LOVING this. This is really neat! And fun! I love the survival take on this. I also really dig that attempting to do an illegal move blocks you from ever using that square. It's a great way to enforce for the player that they need to be very deliberate in their moves. Thanks for playing it! The knight's distinctive movement is really compelling and attractive! When I thought about all the ways I could approach a "chess game," this immediately leaped out at me. I finished it! It's out! Game has 4 difficulty modes and an unlockable endless mode (if you beat Gauntlet or Onslaught difficulties). It has story cinematics for some reason! I was very touched and fascinated by developer Frances's All Alone in a Small Island, a submission for the most recent weekly game jam. In a lot of ways it's quite simple. For a gardening game with a day counter, it surprisingly doesn't limit your actions in any given day. Further, it doesn't seem as though accomplishing your given task is all that challenging. However, what else is in the game is incredibly important, just as it's incredibly important what isn't in the game. I'll be thinking about this game for a long time.